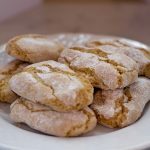 The Sienese Ricciarelli are Tuscan Christmas marzipan cookies. In a medium bowl pour all ingredients (only 150 gr caster sugar) and stir with a tablespoon. Prepare the sugar syrup by adding the remaining 23 gr of sugar to the water and putting on the burner until it boils; pour the sugar syrup onto the mixture. Sift the flour and 10 gr of icing sugar and baking powder and add in the mixture. Beat lightly the egg white and pour in the mixture with 10 gr of icing sugar. With your hands work the dough quickly and lightly until compacting. Leave to rest in the fridge covered with a moist kitchen towel for about 30 minutes. Line a baking tray with a parchment baking sheet. Dust a working surface with icing sugar giving to the doughshaping to your biscuits a rhombus shape (preferably). 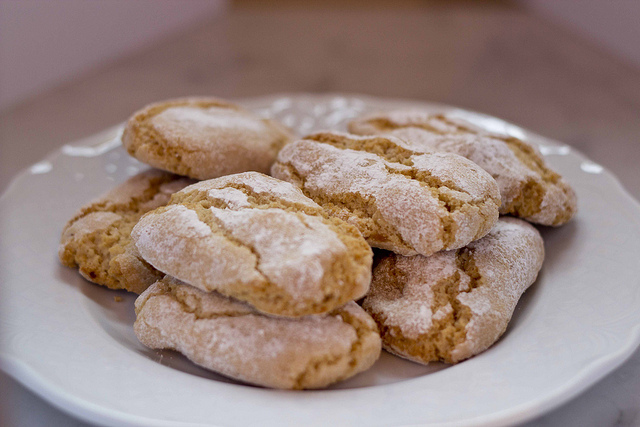 Dust each biscuit with icing sugar (from you working surface). Bake for about 8- 9 minutes until form a small crack on the surface. Cool down. Serve at room temperature. Marco Giudizio is 31 years old and lives in Florence. He studied French and Italian Pastry Art. During his free time he likes travelling, walking, swimming and testing new sweet recipes. He also loves pastries and discovering new cultures, tastes and places.